How These ‘Green’ Groups Convince County Administrators to Harass People Like Martha Boneta | Virginia Right! Small family farmers are the backbone of America. Always have been, and always should be. I say should be because groups like the Piedmont Environmental Council have declared war on the small farmer in an effort to help implement the UN’s Agenda 21 plan to move people out of the country and the suburbs and concentrate them in extremely high density units in large cities with high speed rail connecting these humanity clusters. And everything from the amount of water you use to the temperature in your unit will be completely controlled and metered out by the government. If you want to know what is happening with Martha Boneta’s farm PLEASE take 9 minutes and 31 seconds of you life to watch this video about Agenda 21. In less than 10 minutes you will understand what is happening at Liberty Barns and why Martha Boneta’s fight is OUR fight. This video will make your jaw drop! video above at about the 5 minute mark. Martha’s land will simply be returned to the wild and man will be prohibited from setting foot on the land forever. And if the voters and other farmers and land owners in Fauquier County think Schwartz will stop his insane land grab with Boneta’s farm, you are as crazy as Schwartz is. This Democrat is all about controlling what you do with your own land, which he wants to take away from you. Mike Kane – Agenda 21 implementation expert – PEC member. both aligned against property ownership and individual liberty. But how do they get a majority of members of a board of supervisors or a town council to go along with the radical left wing agenda? After all, some are bound to be Republicans, right? Well, as usual, follow the money. Let’s take a look at one of the left wing radicals that is attacking Martha Boneta and leading the harassment charge against her and her farm. This radical’s name is Michael Kane, a “conservation officer” with PEC. Kane has more than a decade long history of working to implement the United Nation’s Agenda 21 plan to dominate the globe under the guise of conservation and sustainability. If Mikey has his way, you will be living in a small box in a tenement highrise with everything you think, do or say tightly controlled and regulated by the global One World government. You will not own a car, you will eat sustainable foods (which do not include animals) and you will not own property or weapons at all. Now Mikey expects a greater reward and preferential treatment when he finishes taking away your property no doubt. But like all the “useful idiots” that are the product of the new world order education system exposed in the video, Kane and people like him will be pushed aside when they have served their purpose. That doesn’t mean the brainwashing didn’t take. Kane’s actions stand as testament to the effectiveness of the process. But as I mentioned before, these groups use money to entice county and city government officials to turn on their own people. Kane’s first success came in Bucks County, Pa in 1998 when he successfully managed to get the County Board of Supervisors to vote 8-0 to implement his Agenda 21 property rights nullification agenda. His words were not necessarily persuasive, but the money behind him was. Take a look at this document Michael Kane wrote in 1998 “rewarding” the supervisors with $559,772 to buy up private land and put it in government hands. 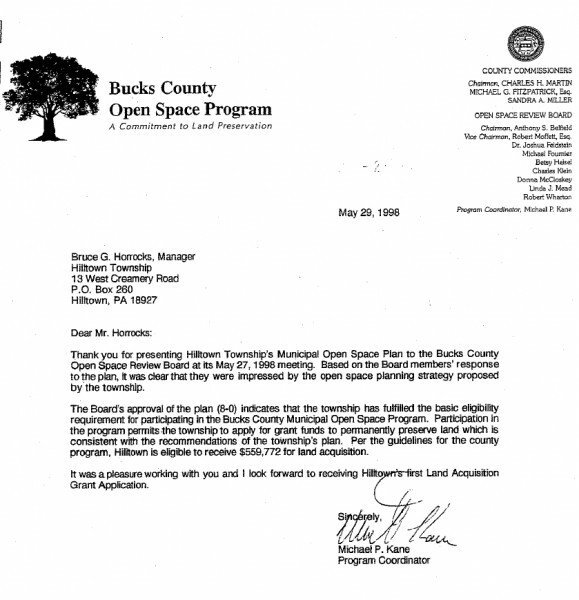 That was a pretty good start for Bucks County in 1998 to buy up land in Kane’s “Land Acquisition” scheme. 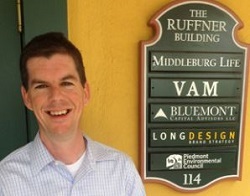 More recently, Mike directed the start-up of the Loudoun County (VA) Purchase of Development Rights (PDR) Program. The PDR Program protected through conservation easements over 2,400 acres of Loudoun’s nationally recognized historic and scenic landscape between 2001 and 2004, including nearly 1,000 acres of natural areas and historic sites in the county that are now open for to the public to see, visit, and experience. More land grabbed away from private ownership and now under the control of government and far left eco groups like PEC. And notice it says the land is now open to the public to see, visit and experience. For now. Until the plan is more fully implemented and then the land will slowly become off limits to all. there will be no access roads, no trails and no human traffic. The land will become a red zone and never used again. And now Kane has spread to Fauquier County and has small farmers like Martha Boneta’s land in his cross-hairs. There are conservation easements on her property that existed before she bought the farm. And it is the existence of these easements that, in exchange for tax considerations, subject her and others to harassment from PEC. How successful has PEC been in obtaining control of land in Fauquier County? this map from the PEC website will shock you. 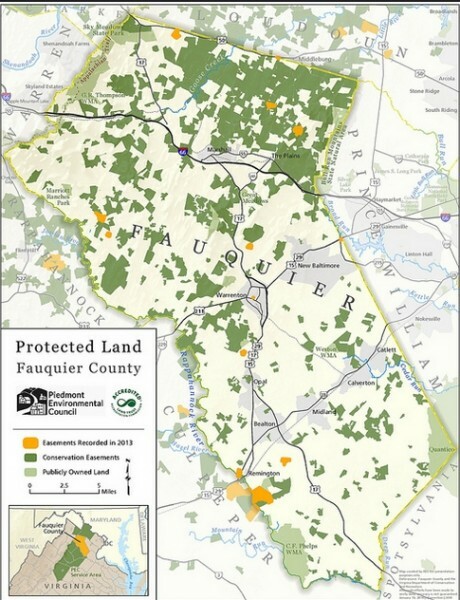 Michael Kane’s plan is to turn this entire map green and kick Martha Boneta and the rest of the land owners out of Fauquier County for good. Notice the map does not mention anything about Private Property owned by individuals. That shows you where their focus lies. The other maps on the PEC map page show things like Watersheds and other data that will allow them to grab large sections of land through EPA regulation or strangulation. And they have their plans mapped out here showing various house and senate districts that they are targeting and other places they are concentrating on taking away from private owners. So what happens when PEC comes out to a farm to observe and inspect to ensure proper usage of conservation easements and the tax incentives? This easement has to do with the land, so is it reasonable to expect that they will look under your beds and in your closets? Of course not, but this is the type of harassment Martha Boneta has been subjected to. Watch this short video and you will see just how out of control Michale Kane’s storm troopers are. Robert Marmet knew he was supposed to inspect Martha Boneta’s farm, but he didn’t know exactly what for. He knew there were limits on what he could inspect, but he had no idea where they were. So when Marmet, a senior energy policy analyst with the Piedmont Environmental Council, and his partner Mike Kane, a conservation officer with the group, turned up June 12 to inspect Boneta’s Liberty Farm in Paris, Va., they more or less inspected what they wanted to inspect. They walked through the upstairs and downstairs portion of the barn that sits on the property. They inspected every room within—bathrooms, closets, storage rooms and offices. They looked over the farmer’s personal effects and even toured the basement area of the barn that housed some of the animals. They inspected “The Smithy,” an historical structure on the property that was once a blacksmith shop. They stood on chairs to peer into the loft area. Robert Marmet is a Senior Energy Policy Analyst for PEC. His job is to stop power lines, transmission lines and anything that makes rural life possible in the energy field. Without power, the land is easier to grab. And Marmet is also responsible for filing lawsuits to stop the spread of power transmission lines. Exactly what did Marmet hope to find in Martha’s closets and under her bed? 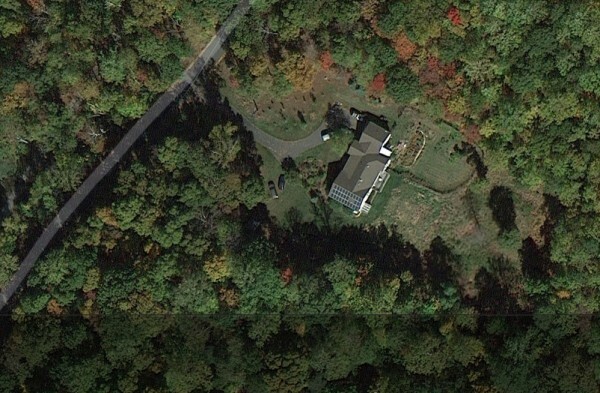 And if you are wondering just how extravagantly people like Marmet live by sucking the land from farmers, this Google shot of his house should tell you that environmental ideologists are making a nice living from the money people behind the implementation of Agenda 21. So after looking in Martha’s closets and under her bed, Marmet goes home to a martini and his own 7 acre slice of wooded heaven that he wants to take away from Martha. And I wonder if Democrat Supervisor Schwartz has been subjected to the same level of harassment as Martha has. In fact, I would venture a guess that Schwartz has never been subjected to anyone looking under his bed and in his closets despite his lucrative tax concessions under his Open Space Agreement. It would be interesting to have the information on his inspections. And if you want to see what land Schwartz owns this is public information. Go here and click “Real Estate Public Inquiry” on the left column (in the green) under the heading “inquiry Options” then click the gray box that reads “Name” and put in Schwartz or any other property owner. Compare the increase or lack of increase in taxes and see if this is comparable to your own Fauquier taxes. Schwartz and Marmet are pretty flat. That may be the case in Fauquier in general, I don’t know. Boneta claims in a lawsuit filed last month in Fauquier County Circuit Court the inspections are part of a pattern of harassment. Her case accuses Peter Schwartz, a member of the elected Fauquier County Board of Supervisors and former member of the PEC board of directors, of, among other things, telling zoning officials he wants the rules “aggressively enforced” with regard to the farm. She also claims PEC should not be allowed to be involved in the enforcement of the easement. She said before the PEC sold her the farm in 2006, it owned both the property and the easement, which is illegal under Virginia law. Almost all property owners with easements must endure routine inspections by the land conservancies or other organizations that enforce the easements. Usually, they are low-key and friendly. Landowners are apprised of violations, and the sides work together to address them. This is not the case with Martha Boneta. Groups like PEC and weak minded supervisors who are unable to see the writing on the maps do not realize that the harassment they condone and assist today will be knocking on their door tomorrow. And the rest of the farmers and land owners in Fauquier County and the rest of the country that sit back and think it won’t happen to you are misinformed and naive. When the day comes that you no longer serve a useful purpose, your land is next. I hope Fauquier County Citizens will expose PEC and the plot they are implementing. One quick way to start would be to elect people to the Board of Supervisors who pledge to kick PEC out of the county. And please, for all our sakes, get rid of Peter Schwartz. Fauquier is far too beautiful to turn over to the United Nations. Thank you for your dedication to bring awareness to all the inhabitants of earth. I live in California and this is being perpetrated all around our community and people can’t see it. Why is Knowledge so difficult to find in a world full of chaos? Thank you for the kind words, Jill. This is SO important. Martha is a friend and she loves and respects the farming life and the animals. She has been a trooper in this fight and I applaud her for not throwing in the towel. She is the firewall in Virginia right now and deserves far better from her elected officials. This makes me absolutely insane. Let’s hope Mark Levin’s Landmark Legal Foundation sticks it to the EPA. Obama’s EPA is constantly encouraging all kinds of Red’s to harass Red, White, and Blue’s, over supposedly Green Issues. It’s all about the greed of money and it definitely has gotten worse under Obama. Obama is all about greed and taking things away from people in America. We have to fired these nasty idoits in county offices and hire respected individuals not career politicians that always lie and keep on lieing. First, let’s talk about what we can do, not what we hope happens or want to happen–but what we can make happen. 2. Feature him in our upcoming 4th Edition of our Insert, exposing to some 5,000 homes in this area what a colossal windbag this cat really is. 3. An orchestrated letter writing campaign ( with BIG pictures) of this cats home, exposing his hypocrisy for all to see. This guy is the local version of Al Gore, running around telling everyone else how to live from his moated expansive loft. The problem with the approach we are using is we are constantly “singing to the choir” Who reads VaRight ? Who bothers to read these articles ? The people who are already on board, it isn’t a trick question. Drop the “civil” nonsense, stop with the ” we got to get along with the chiefs running the reservation” nonsense. This is a damn war and unless and until those in the Patriot movement decide to fight, all the whimpering and whining in the world won’t do so much as crimp their steady march towards owning us, and controlling every aspect of our lives. I would make these two jackasses my own personal projects if I were in Faquier County. Fight or count on the feckless courts of Mark Levine to save us ? No Thanks- I do my own fighting. Wow! If it were me, both those women would be dead. Abusive government and those that advocate for it have no place in America. Secondly, take a contingent of like minded individual patriots, visit Marmet’s home and shoot out his solar panels before standing him against his wall. Set fire to it and go off and have a beer. The time for revolution has long past. If I wasn’t blessed with my five year old, I would have died ages ago on a pile of spent brass casings. Keep up the good work Tom, we have your back.